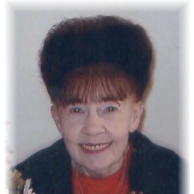 Mary Ester Gauthier (Gilliland) passed on to eternal life to be with the Lord on January 18, 2109, surrounded by her family at her home. Mary was the daughter of Edward and Eileen Gilliland. She was the beloved wife of the late Denis B. Gauthier. Mary is survived by her brother Edward Gilliland, Jr.; her five children Maryann Pinto of Stafford Springs, Denis Gauthier Jr. and his wife Elizabeth of Bristol, Steven Gauthier, Richard Gauthier, Teresa Parks and her husband Billy all of Bristol. Mary is also survived by her nine grandchildren, four great-grandchildren and one great-great-grandson. Mary worked for 28 years for Bristol Springs before her retirement in 1999. Mary was a very special lady to her family and friends and to all who knew her. She will be greatly missed. Calling hours for this very special lady will be held on Thursday January 24, 2019 from 7 PM until 9PM at O’Brien Funeral Home, 24 Lincoln Ave., Forestville/Bristol. The burial will be privately held at St. Joseph Cemetery.